Interface Force is the UK distributor of GP:50. Now available is the Model 188 miniature flush diaphragm pressure transducer. This sensor has been developed to fit into restricted spaces, yet offers pressure measurements up to 10,000 psi with accuracy to ±0.05% FS. It has been constructed as a single all-welded piece in high performance, rugged stainless steel. Its flush port design eliminates any dead volume making it perfect for high viscosity fluid pressure measurements without any port clogging or plugging. This transducer is ideal for use in the oil and gas industry as well as more diverse applications such as paint and adhesives dispensing, food processing and sludge and slurry pressure measurement. 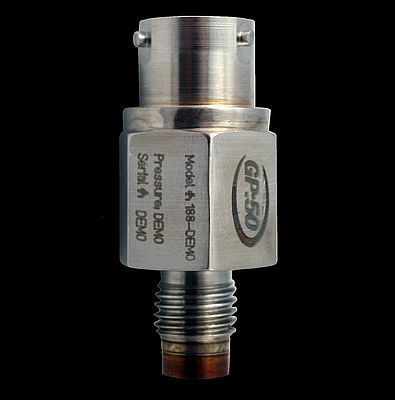 As with all sensors in the GP:50 range, the Model 188 is supplied with a NIST traceable calibration certificate and has also been rated for high shock and vibration applications. A number of field options are available including extending the operating temperature range from -54°C to +121°C .